Prenatal diagnoses of chromosome abnormalities are performed by conventional cytogenetic analysis using in vitro culture of fetal nucleated cells retrieved by amniocentesis, chorion biopsy or fetal blood sampling. 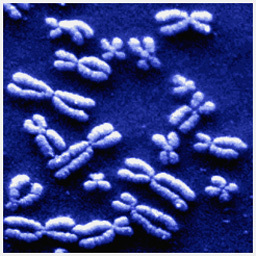 Karyotype analysis allows detecting numerical and structural changes in all chromosomes but it is time consuming and requires great technical expertise. Improvements in culture media have only partially reduced the interval between the collection of the samples and the reporting of the results. This is a very anxious time for the parents, particularly if non-invasive screening tests (biochemical and/or ultrasound), performed during the first trimester of pregnancy, have suggested an increased risk of common chromosome disorders. The need of rapid prenatal diagnoses prompted the use of the Fluorescent In Situ Hybridisation assay (FISH) for the detection of common chromosome aneuploidies using uncultured cells. However, the cost of this labour intensive procedure has limited its application mainly to high-risk pregnancies. During the past 10 years, the Quantitative Fluorescent Polymerase Chain Reaction (QF-PCR) has been introduced to perform rapid prenatal diagnoses of common chromosome aneuploidies. The clinical utility of this assay has repeatedly been confirmed together with its high sensitivity and specificity in detecting major chromosome abnormalities. One of the advantages of QF-PCR is the automation of part of the procedure that allows high throughput of samples at a very low cost; this makes rapid prenatal diagnosis available to all pregnancies either as tool to reduce parental anxiety while waiting for completion of fetal Karyotype or to improve pregnancy management in case of abnormal result. Compared with FISH analysis, the clinical application of QF-PCR has the same limitation of detecting selected major numerical chromosome disorders but with several advantages that increase its clinical utility. 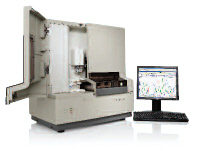 The assay is very sensitive so that an only very small amount of sample is needed for the analysis. The use of highly polymorphic STR markers allow testing samples suspected of being contaminated with maternal cells as well as assessing zygosity in multiple pregnancies. The use of several highly polymorphic and chromosome specific STRs also makes it possible to detect partial trisomies. The efficiency of the assay is not influenced by the gestational age and the high rate of uninformative samples, described using FISH has never been observed. QF-PCR is a rapid, simple and accurate prenatal diagnostic test; in the great majority of cases its interpretation is straightforward. The inclusion of markers on chromosomes X, Y, 21, 18 and 13 in the Aneufast QF-PCR Kit allows the detection of the great majority of clinically significant chromosome abnormalities in a few hours after sampling.